The previous owner was obviously a golf fan. There were even golf tees stuck in patterns of three just above the golf wallpaper. I used them for hanging flower leis from my bridal shower. Here you can see my desk view and the end of my nice huge white board. 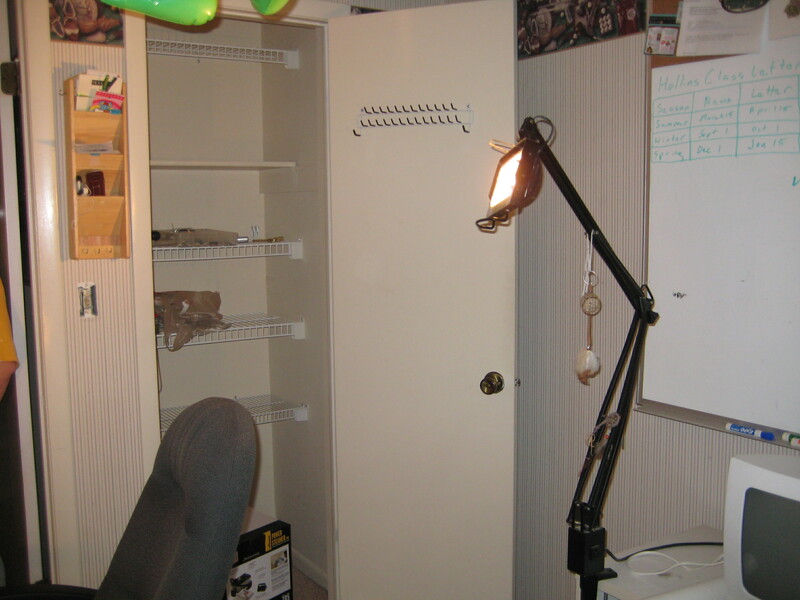 And here’s a nice “before” picture of the closet (this will be important later). 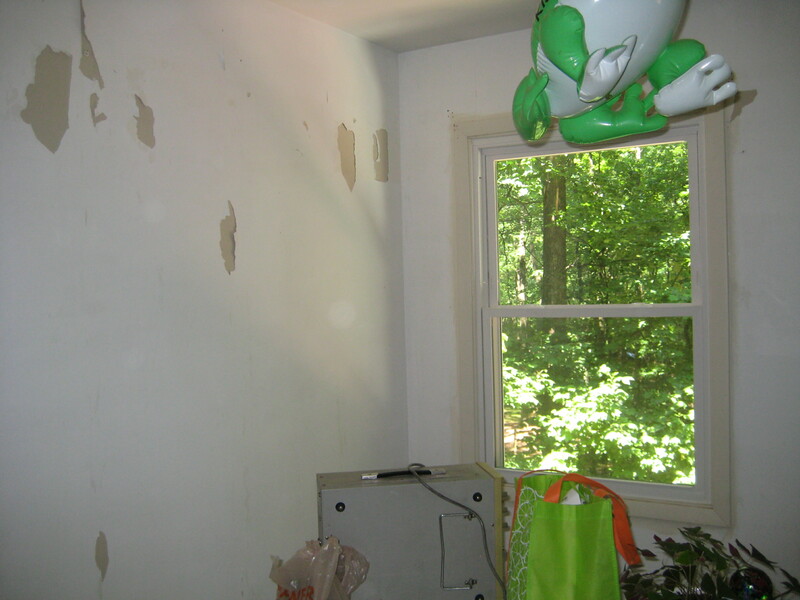 Since I am most definitely NOT a golfer (I used to like mini-golf, though, until my back problems made it difficult) I was very much looking forward to stripping this wallpaper. 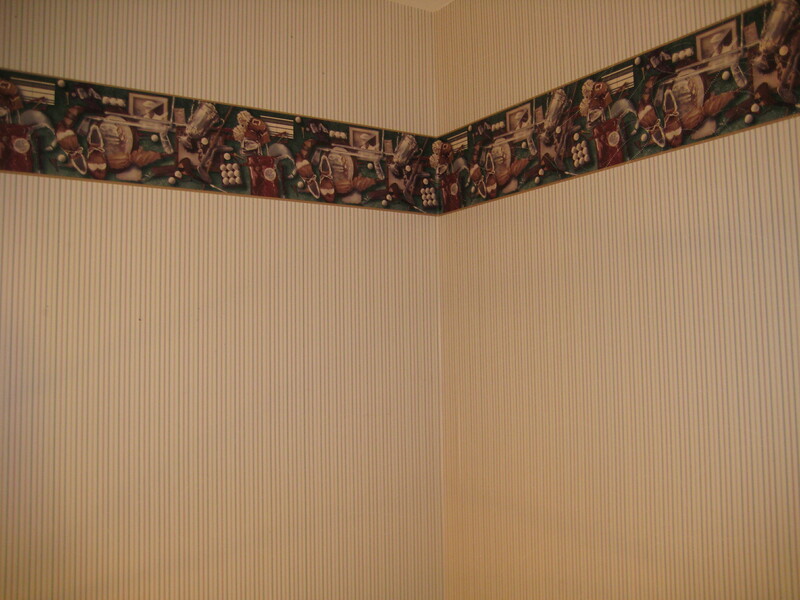 If you ever strip wallpaper, there’s two types. There’s the fun type that comes off with little effort, and then there’s the wallpaper glue of death. We weren’t sure what we’d have here, since the wallpaper in our dining room had the glue of death. I lucked out, though. With the use of the most fun scoring tool in the world, I was able to just run that little sucker all over the walls (sometimes chanting “Wax on, wax off” like the good child of the 80s that I am). I then used a steamer to loosen the glue through all the nice little perforations and peel the wallpaper off with minimal effort! Yay! I was going to post about my color choice, but since I have photos of the closet in the same file as these wallpaper peeling pictures, I’ll talk more about the closet instead. 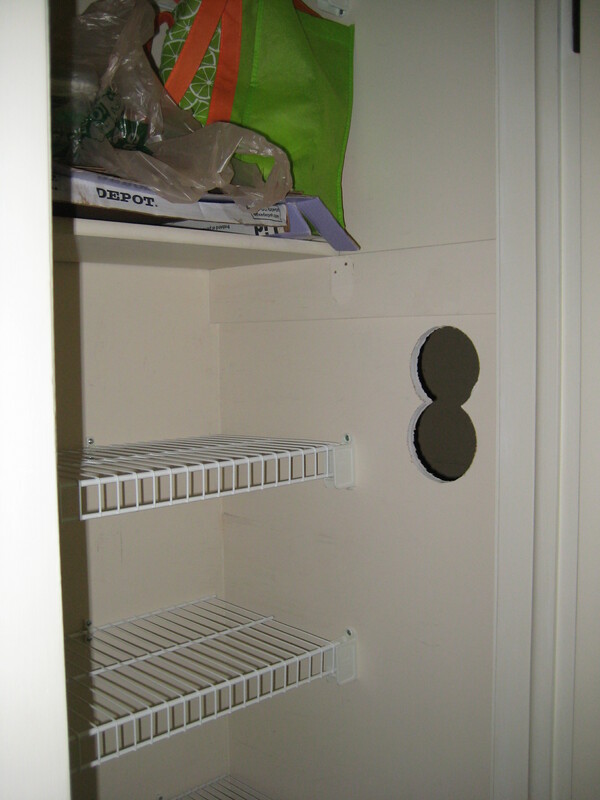 For years, my husband had wondered about the space just to the right of the closet. On the other side of the wall was our laundry chute. However, the chute is about waist-high. So what was above the chute, my husband wondered. He decided that now that the room was torn apart anyway, it was a good time to find out. This closet renovation was brought to you by the number 8! So he drilled an exploration hole. Like he suspected, there was just dead space both above and in front of the laundry chute! 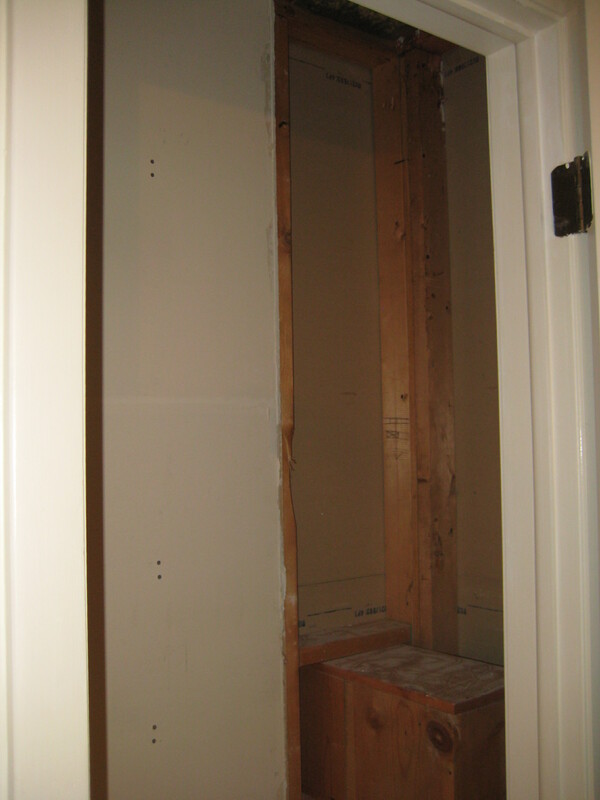 By knocking out the wall and doing some new drywall work, we could increase the closet size by about 50% (I was going to do the numbers so I could post exactly, but I have no idea now where the original and new dimensions are). Awesome! 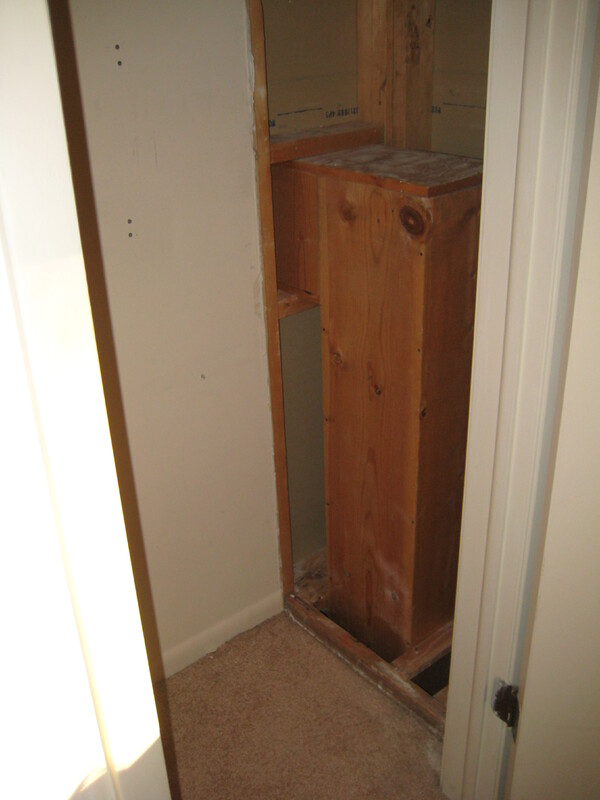 All that raw wood to the right is new closet space! Yay! 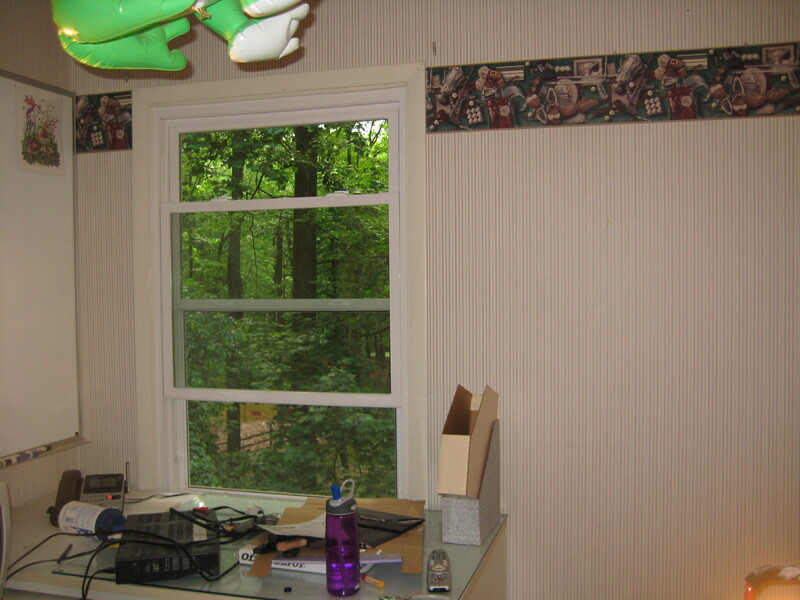 When you’re redoing an office, it’s important to look at the space carefully. Before we even got into the renovation, we’d added a lot of room to the office just by re-hanging the door so it opened outwards, rather than in (taking up a chunk of floor space).